The teams couldn’t have asked for better conditions, with 10-12 knots, glorious sunshine and light waves which slowly built as racing progressed. 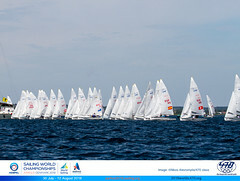 The breeze started out at 240 degrees, then veered left to about 215 degrees for the second race. A fifth place finish in race 2 for the Charles brothers positions them in first overall, with Israel’s Gal Cohen/Dan Froyliche on tiebreak in second, and Italy's Matteo Capurro/Matteo Puppo in third. Onto race 2 and the pair had their gloves off for a race win, which they delivered in style taking the lead from start to finish. “In the second race we were determined the same was not going to happen again and we nailed the start, which really worked out well for us. We led from the start to the finish,” Jim added. “We are happy with today as a good start to the event. I think the last time I sailed up here was about 4 years ago for a 420 selector event, and we have trained here for a couple of days. We were a bit disappointed on narrowly missing out on a medal at the Junior Worlds, so we will be aiming to come up with a medal this time,” said Freeman on their medal upgrade ambitions. Keeping an eye on the competition is key, and the second placed Ukrainians are in their sights. “They have definitely been sailing really well recently and they definitely sailed well in France, so they are one of the top teams,” she concluded. 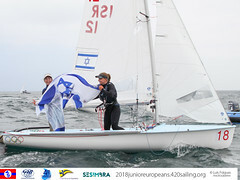 In third overall are Annabel Vose/Kirstie Urwin (GBR), who were last year’s 420 Junior European Champions and stepped over to the 470 shortly after. 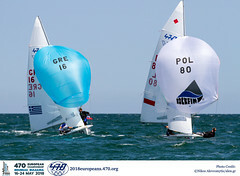 The pair also raced the 470 Junior Worlds, finishing 15th. Impressive to see 420 girls teams outpacing the boys with a crushing performance to claim the top two positions after the first day of qualification. Poland's Ewa Romaniuk/Katarzyna Goralska scoring a 1,3 to lead and Italy’s Illaria Paternoster/Benedetta di Salle finished in 4,2 to end their day in second place. Paternoster/di Salle, claimed the bronze medal at the ISAF Youth Worlds this year, and won gold at the previous year’s Championship in 2012, but are yet to convert this success to the 470 World or Junior Europeans podium steps – this may be their year. Racing is scheduled to start at 1300 hours for the 420 and 470 fleets, but we are expecting some blustery conditions of 24 knots and gusts up to 36 knots forecast at midday.